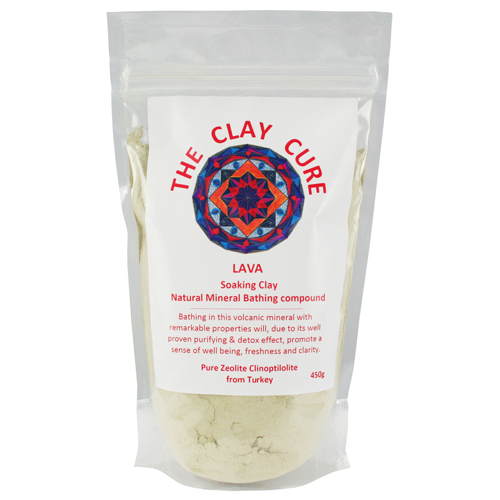 The Clay Cure Company's Lava Soaking Clay is comprised of pure Zeolite Clinoptilolite from Turkey. This amazing mineral is the result of a natural alchemical phenomena that took place when molten lava came into contact with sea water millions of years ago. Zeolite Clinoptilolite has a powerful ionic charge and highly absorptive properties; its molecular structure literally soaks in and locks away impurities, pollutants and other harmful substances. 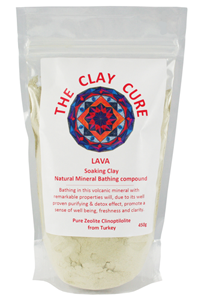 Bathing in Lava Soaking Clay (Zeolite) may help to increase blood circulation, assist in skin cell repair, balance pH levels and remove toxins. Use ½ to 1 cup of Lava Soaking Clay in one bath filled with warm water. Soak your body in clay water for a minimum of 20 minutes. Shower the residue of clay from your skin. It is important to drink plenty of water to re-hydrate the body. It is important to drink plenty of water to re-hydrate the body.